On Tuesday, January 24th Sgt. Field, SRO DiGiacomo, Ptl. Brennan and Ptl. Custis joined Pine Hill Middle School Computer Teacher Mr. Belmonte to present an interactive internet safety class to the 6th grade students. The officers led discussions at four stations; What is Social Media, Cyber Bullying, Computer Security, and Online Predators. 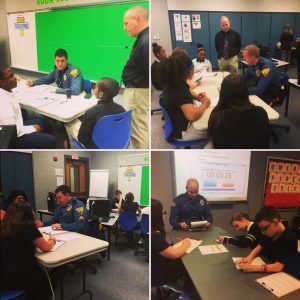 The students rotated to each station throughout the class, engaging the officers in meaningful conversations about their experiences w…ith the topic and steps to take to protect themselves from the inherent dangers while using the latest technology. The officers led discussions at four stations; What is Social Media, Cyber Bullying, Computer Security, and Online Predators. The students rotated to each station throughout the class, engaging the officers in meaningful conversations about their experiences with the topic and steps to take to protect themselves from the inherent dangers while using the latest technology. The Pine Hill Police Department strongly encourages parents to visit the National Center for Missing and Exploited Children Netsmartzkids.org for internet, gaming, cell phone safety and many other safety tips on important topics facing parents and guardians of young children, tweens and teens.